There are so many debatable and simplistic arguments in the recent 3000-word article by Singapore's ambassador-at-large Bilahari Kausikan that it is hard to know which point to address first. The ambassador said a great number of things, many which may have sounded shocking to an average Malaysian. What happened to the ideals of the past? Calling the Chinese "delusional" for wanting to change the current system, hinting that "some systems are easier to work with" and hoping that "the worst doesn't occur" — without any elaboration from the ambassador on what system he thinks it's easier to work with or what he thinks is the worst-case scenario — one cannot help but feel that Mr Kausikan is indirectly supporting the current status quo. Referring to the "cardinal principle" of "Malay dominance" in Malaysia, Mr Kausikan's tone suggested that if something is not broken (at least in the eyes of Singapore) don't fix it.. The system was "coherent" and until recently, "did not serve Malaysia badly." But the irony of the article was where Singapore's separation was mentioned. Didn't the pioneer leaders of Singapore 'rebel' against Malaysia precisely because they rejected the premise of a single race being 'special', where policies are tweaked to favour one race above the others? Wasn't meritocracy, one of the most important building stones of Singapore's policies, formulated in direct opposition to Malaysia's, which afford special privileges to a specific race? Wouldn't it be double standards if Singapore holds a certain ideal for its citizens, but a totally different one for its neighbour, who was and still closely related to the island? After all, don't we all routinely use Malaysia as an example every time we talk about the importance of our meritocratic principle? Singapore's forefathers saw what could go wrong with a biased political and economic system, which was why they chose the painful path of separation instead. To say now that Singapore prefers a familiar system, one that Singapore rejected in the past, seems almost hypocritical and worse, ignores one of the fundamental principles behind the founding of the country: that no one race should be favoured above others. Have we forgotten Lee Kuan Yew's famous phrase "Malaysian Malaysia", which opposed the racial policy? Why can't hopes be reality? Criticisms to the article have been fast, furious and harsh.The most prominent one came from DAP party member Tony Pua, who likened Singapore to being a "mercenary prick". Mr Kausikan responded to this and other criticisms by insisting that "hopes are not reality". Is he perhaps suggesting that one should not aspire to a better society, but be content with what is actually achievable? The ambassador seemed to have forgotten that fifty years ago, a group of leaders were faced with the same choice of being realistic or hopeful when confronted with the prospect of separation. They chose the latter, hopeful that a small island-nation could make a mark in the world without needing to favour any single race. The rest, as they say, is history. Malaysia is indeed on the precipice of change. Even if the current system is familiar, it has proven that it does not work in the long run. At least not to the country and its citizens, which explains the issues that are now plaguing the nation. It has done more harm to the country more than good and one does not need to go far to see the results of two opposing systems at work. Malaysia continues to flounder economically while Singapore is still an economic force and making headways internationally. 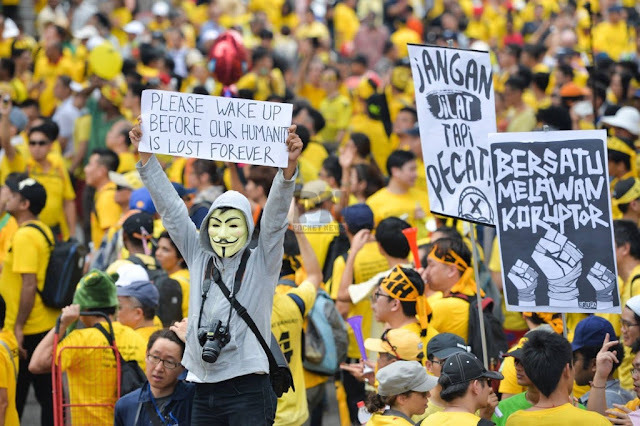 So isn't it natural for Malaysians to want to push for change, in hopes of something better?